It all started in 1735 with Handel who wanted to fill in the gaps between acts in his oratorios and to attract an audience who preferred individual display over collective effort. He wrote 16 - at least 16 have appeared in print, although as ever with Handel, many did not actually begin life in that guise - and hugely successful they were too. Handel's organ concertos remain the pre-eminent examples of the genre, but they are by no means the only ones, and while Wikipedia’s English language site lists 64, this number is manifestly wrong (does anyone with a brain seriously look to Wikipedia for reliable information?). What the correct number should be I have no idea, but so many major works are missing from the Wikipedia random pile that someone should do the world a favour and expunge that page of misinformation from the World Wide Web in case some imbecile does, actually, believe it. What nobody can deny, however, is that after Handel, the only Organ Concerto to have gained any degree of common currency is the G minor one composed by Poulenc in 1938. Forget the fact that those by John Stanley, Joseph Haydn, Marco-Enrico Bossi. 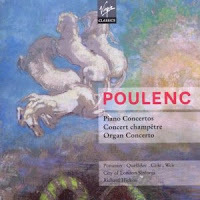 Josef Rheinberger, François-Joseph Fétis, Joseph Jongen, Aaron Copland, Malcolm Arnold, Alun Hoddinott, William Matthias and Kenneth Leighton (to name an unrepresentative selection of some of my personal favourites) are every bit as good, the Poulenc has, for some reason, caught the public interest and gets a very frequent work-out indeed. My preferred recording of the Poulenc is the Gillian Weir one with the City of London Sinfonia under Richard Hickox, but there are many others and barely a year goes by without a new crop appearing, the latest coming from Guild. The soloist on this new disc is Martin Heini, the orchestra is the State Philharmonic Chamber Orchestra of Novosibirsk and the conductor Rainer Held. With the best will in the world, these are hardly household names and it might seem that there is no call for a new version of the Poulenc from an organist little known outside his native Switzerland, playing with a little known (outside their native Siberia) chamber orchestra and a conductor who is, it would seem, making his CD début. And for all its good points – a fantastic-sounding organ, a player who is not afraid to take risks, and a recorded sound bristling with clarity but wrapped in a magical halo of distant reverberation – this is not a first choice recommendation. Rainer Held rather overdoes the melodrama and pathos and the orchestra is hardly at the cutting edge of tautness of ensemble or uniformity of intonation. But there’s something on this disc that makes it not so much compelling as absolutely unmissable ; a new organ concerto which is, for my money, one of the very best to have emerged since Handel’s final one appeared during a performance of Alexander’s Feast in 1751. Composed exactly 260 years after that last Handel Concerto, Swiss composer Carl Rütti’s Concerto for Organ, Strings and Percussion is his second venture in as many years into the genre. For my money, Rütti’s outshines the vast majority of its predecessors and certainly gives the Poulenc a good run for its money. Actually, I’m not entirely sure that, in some respects, it outshines even that icon of the genre. For catchy tunes, riveting rhythmic drive and spectacular organ v. orchestra effects, it is in a class of its own, even if the first idea we come across bears a striking resemblance to the Bee Gees’ classic, Stayin’ Alive. The orchestra impresses from the start, buzzing with incisive rhythmic vitality and crackling with high-voltage energy. Martin Heini adds a few thousand volts to the proceedings with his decidedly pugilistic cluster chords and sparkling fingerwork. Written specifically for him (the booklet notes highlight the pivotal role he played in encouraging the composer to write the work in the first place), the Concerto clearly is designed as a showcase for an exceptional virtuoso player who amazes and impresses at every twist and turn of this high-octane score. Cleverly calling for the same orchestral forces as the Poulenc, Rütti does away with the timpani and replaces them with a veritable battery of tom-toms, cymbals, temple blocks, snare drum, tambourine and triangle, all deftly handled here by percussionist Mario Schubiger (and full praise to Guild for including his name in the disc details, so often the poor timpanist is overlooked when it comes to the Poulenc). The organ – a 45-stop three manual built in 1996 by the Swiss firm of Goll in the church of St Katharina Horw near Lucerne – gets a full work out; most especially in the slow movement where luscious strings in sumptuous chords gradually transform themselves into bird-song inspired, quasi-Messiaenic outbursts on full organ. 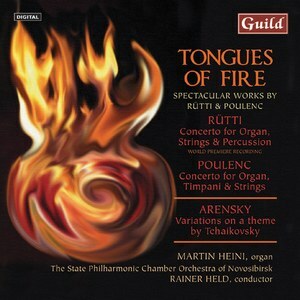 Hints of Messiaen also fly past in Tongues of Fire, in which Rütti draws together plainchant and birdsong in a seven-minute tour-de force for solo organ. While, maintaining the orchestra/organ balance, the State Philharmonic Chamber Orchestra of Novosibirsk presents an atmospheric account of Arensky’s Variations on Tchaikovsky’s Légende. No stranger to the catalogue, especially where Russian orchestras are concerned, Held’s affectionate reading never falls into the trap of becoming lugubrious, and if you can accept the distinctly churchy acoustic which surrounds the string playing as well as small moments of uneasy ensemble, this makes an attractive if hardly compelling addition to an enormously rewarding disc. I did read a review which suggested that the disc had no clear market in mind, and I see the point; those who love organ solo music often do not inhabit the same musical territory as those who enjoy rich romantic Russian string music. But if this disc draws these two disparate groups together, so much the better, and if it helps draw the Rütti concerto to the wider attention of the general music-loving public, the eclectic programme mix on the disc will prove to be truly inspired. Oh for the day when the term Organ Concerto does not confine itself to Handel and Poulenc. This posting provoked three thoughts, which I thought I'd send in response. Firstly, relief at seeing your blog updated, after nearly a month of silence. Remembering you interest in buses, I had begun to fear you might have fallen under one. Enjoyable, as ever. Secondly, a word in defence of Wikipedia, from one who does indeed possess a brain, in a physical sense, even if it does not always function as effectively as it ought. I find Wiki to be a very useful resource, and I do frequently use it as the first port of call to read about a topic. I have heard that benchmarking with Britannica has shown it to be almost as reliable and more up to date, in mainstream areas, and to have something to say on a lot more arcane topics, albeit with less reliability. 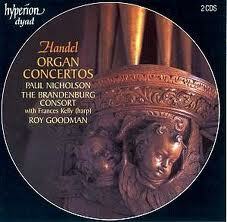 And organ concertos may be more specialist than organ transplants or organ soup recipes (at least in Singapore). But the point about Wiki is that if you see gaps, you can update it yourself - and I would imagine that you are something of an authority on organ concertos, so why not ? Your comment begs a further question: what were you doing on Wiki, if not looking for reliable information ? Thirdly, I did feel for poor old Arensky. The CD cover claims to feature "two spectacular works", and so the third must be..... by Arensky. It does seem like a Siberian space filler on the CD, even though it may be highly popular in Novosibirsk. Odd also that the CD is titled Tongues of Fire, when one of the composers has the unusual honour of having a glacier named after him. If you believe Wiki, that is.